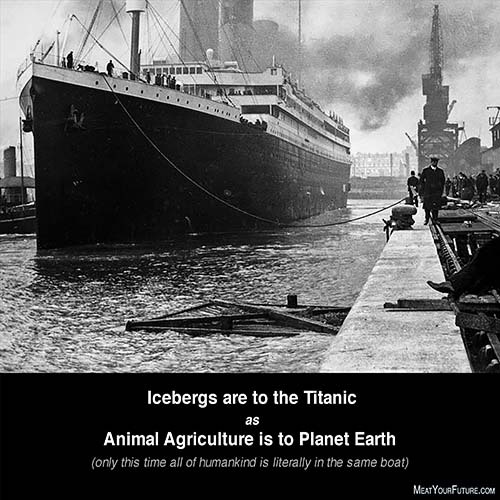 The Titanic and Animal Agriculture - Is There An Anology? 104 years ago today, on the morning of April 15,1912, the RMS Titanic sank on its maiden voyage from the UK to New York. It was the largest passenger steamship at the time, said to be “indestructible”. Yet it struck an iceberg and sank, resulting in the death of over 1,500 passengers. The Titanic operators received (but largely ignored) warnings from nearby ships about icebergs. Could there be any analogy to our current environmental situation? Authorities currently warn about the massive destructive role that animal agriculture is playing in our environment, being the leading driver of DEFORESTATION, LAND USE and LOSS OF BIODIVERSITY, producing MORE GREENHOUSE GASES THAN THE ENTIRE TRANSPORTATION SECTOR and, because raising animals for food is so inefficient and water intensive, that it will lead to FOOD SHORTAGES in the near future as our population grows. Scientists warn that none of the foregoing can be effectively or adequately addressed UNLESS THERE IS A MASSIVE GLOBAL SHIFT AWAY FROM ANIMAL FOODS. Yet, we are not seeing a massive dietary shift to eliminate animal foods from our diets — at least not at the speed or scale needed. Are these warning falling on deaf ears, not unlike the warnings about icebergs in the case of Titanic? Do we think our planet’s environment is indestructible, as was thought of the Titanic before it sank? Let’s pay attention to the scientists’ warnings and stop using animal products. In addition to be an urgent collective action needed to protect and restore our environment, such a shift would also benefit our personal health and, of course, avoid the needless suffering and death currently inflicted upon billions of helpless animals each year.